Ellie: Then Marilyn would come back and say “There’s too much salt,” and analyze [each recipe] for sodium and fat. We’ve set pretty tight guidelines. What made you decide to start writing cookbooks? Ellie: I’ve always liked writing cookbooks, but felt like the recipes needed to be further analyzed. I wanted to work with someone who really understood the whole nutrition concept. Marilyn had developed a guideline, which I really think the whole food industry should adopt, to have the number of calories align with the amount of sodium in each meal. Marilyn: I don’t know if I have a favourite dish to prepare. There are a lot of dishes in the book that we make on a regular basis. You have the main dish, and you have the various side dishes. We make sure they’re balanced, so you’re following Canada’s Food Guide. Ellie: The side dishes are very simple, just one or two ingredients. It’s a way of making broccoli or brussels sprouts a bit more interesting. We put them together in the dinner chapter, assuming people will mix and match. What’s the most challenging thing you’ve ever made? Ellie: For me, it was making ravioli, which I don’t think I’ll ever bother doing again. It’s fun, if you have half a day or more. 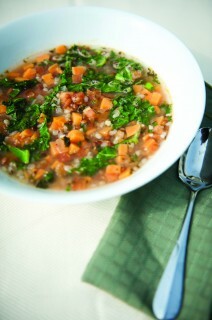 Recipe for red lentil soup with fresh herbs and kale from Fresh & Healthy Cooking For Two. Are most of your recipes easy to make? Ellie: The strength in the way I write recipes is that they incorporate everyday ingredients; you don’t have to go to a specialty store. Each recipe only takes 20-30 minutes max to create, and I try to make the recipes as simple as possible. What’s the most challenging part of writing a cookbook? Ellie: Making sure you give enough information that people can follow, which is getting harder and harder because fewer people have much in the way of cooking skills. But the recipes also can’t be too long. Are you going to follow a recipe every day that’s a page and a half? Marilyn: We also wanted to include options that are equally tasty and nutritious. How long did it take you to create the cookbook? Marilyn: It took us all of four years to make the cookbook and to test and analyze the recipes. We’re both retired now, apart from writing cookbooks, and do it on a part-time basis because we really enjoy it. Marilyn: That’s a question I used to ask when I was doing presentations to get people to think about food and whether they eat to live or live to eat. Personally, I like a lot of different foods, right across the spectrum. Marilyn: Especially chocolate, that’s right! Ellie: My favourite category would be soups. It’s easy because I have a garden. 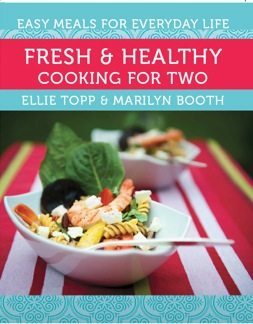 Join Marilyn and Ellie on Saturday, October 27, from 1-3 p.m. at Thyme & Again for a book signing and to sample of some of the recipes from their book. Fresh & Healthy Cooking For Two is available at various bookstores throughout Ottawa.